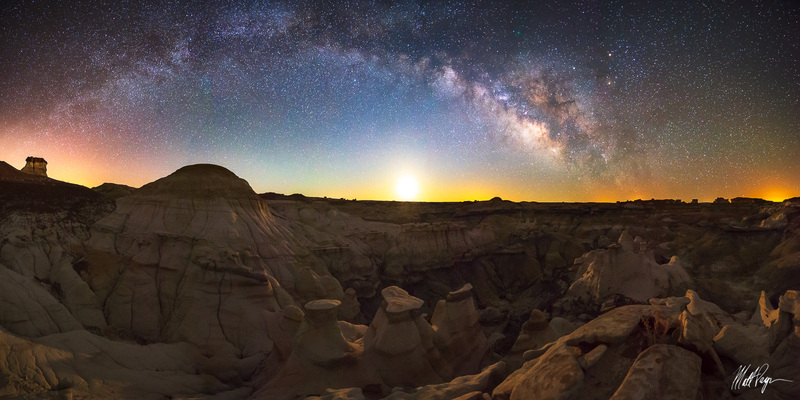 For this April nightscape fine art panorama photograph of the Milky Way from New Mexico, I scouted the area in the day time on a separate trip and created a GPS track so I could find the exact spot again at night at a later date. Wandering in the dark in the hoodoo-strewn desert landscape of the Bisti Badlands and the De-Na-Zin Wilderness is such a surreal experience. No sounds. No light except from the stars. No other living animals. Just me and the night sky. About 30 minutes into my photo shoot I noticed the 35% lit moon rising on the horizon, which added some great ambient light to the scene.